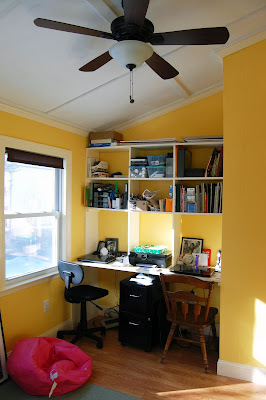 I thought that as we wind up this year I would take a look back on my blog and bring you the 10 most popular post of 2014. It was a great year for us with the birth of our second daughter and many, many happy memories with family and friends. Looking forward to what 2015 will bring. 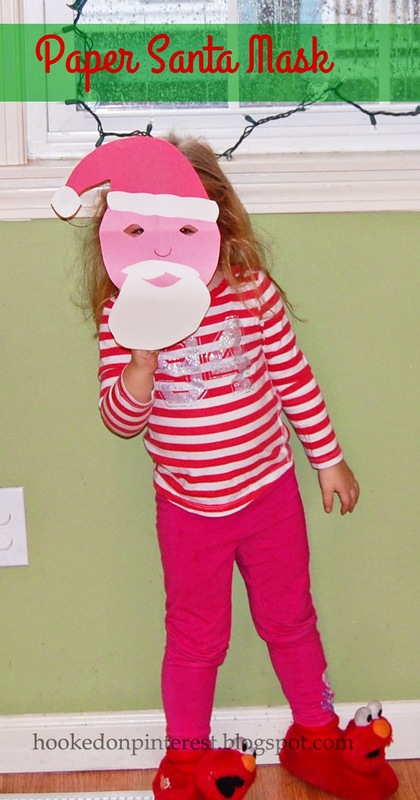 My daughter is really into making these paper masks this holiday season. 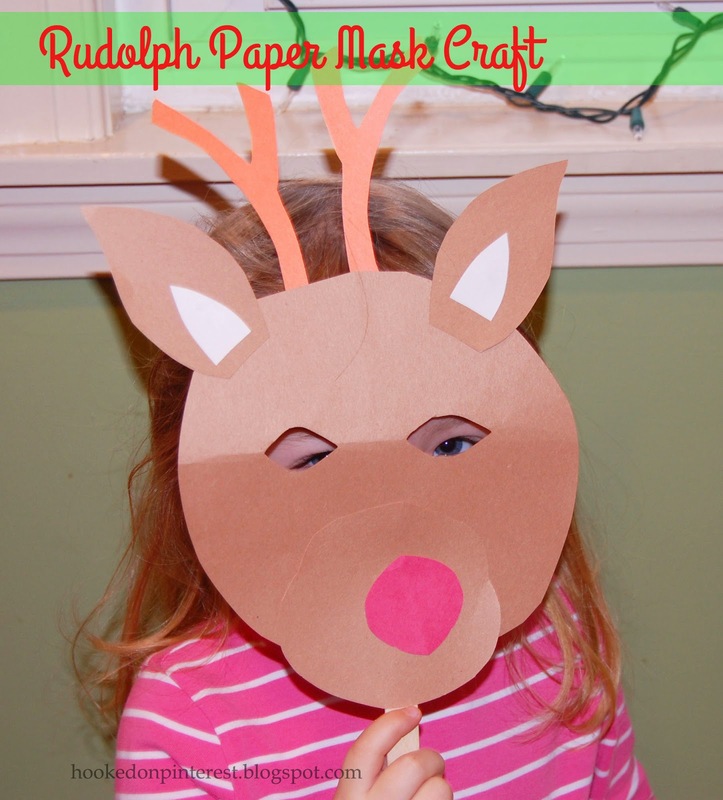 Here is our most recent creation, Rudolph the Red-nosed Reindeer. 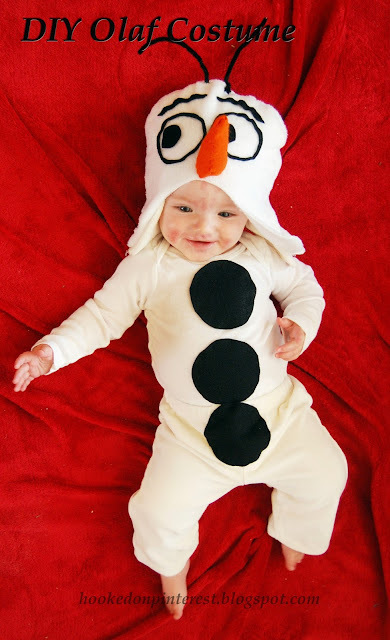 Here is what you need to create this mask: Construction paper, glue stick, scissors, tape and popsicle stick or straw. 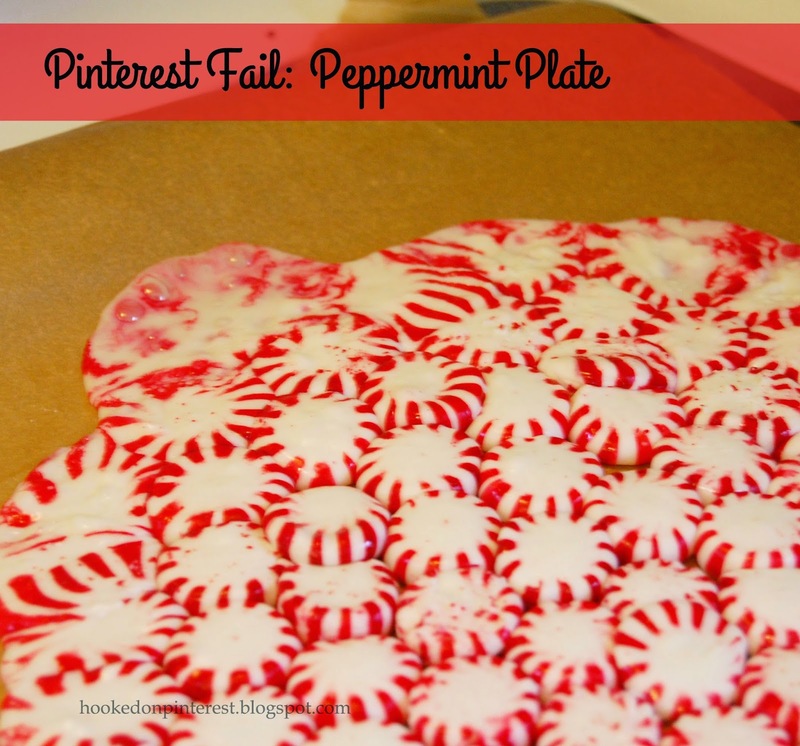 I've been seeing idea of cooking peppermint candies in the oven and creating a decorative plate. This looked relatively easy to try and if it had worked it would have been a get addition to my Christmas Eve table. But, this was not the case, this was defiantly a Pinterest fail. I used peppermints from another Pinterest fail, a peppermint wreath. 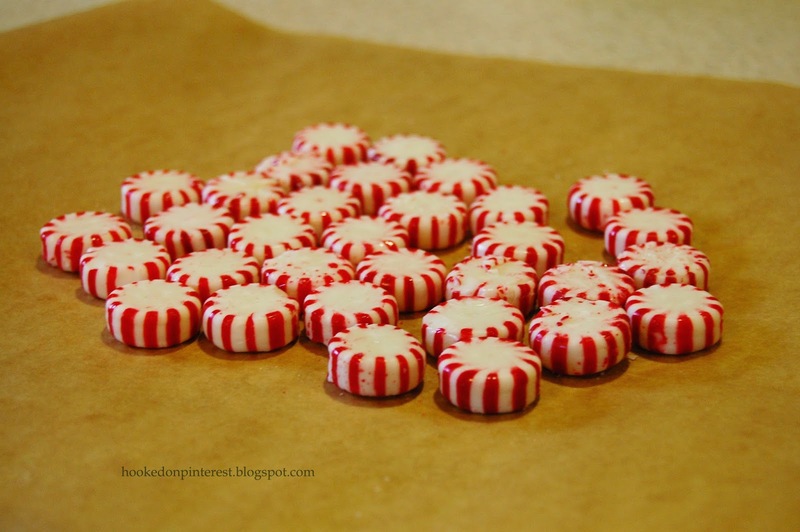 We unwrapped the candies and arranged them on the parchment paper. 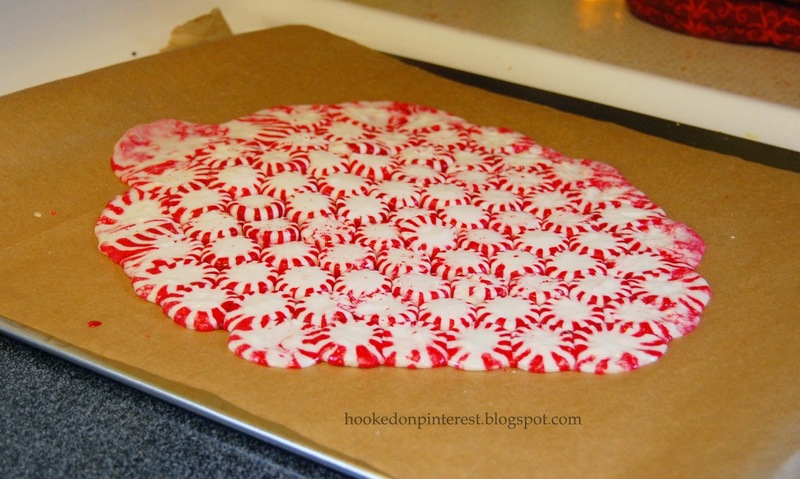 Then we cooked the peppermints at 350 degrees for 10 minutes. 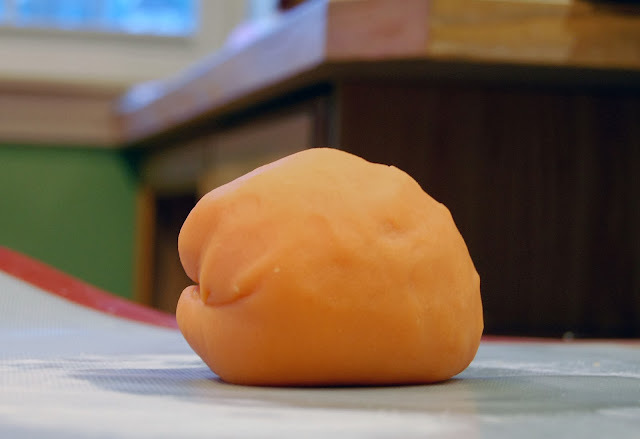 When it came out, the outer edges were bubbled and the center was only slightly melted. Now this could have something to do with my oven, it is pretty old. I would love to hear from anyone who had lucky trying this craft. Over the holidays we have made many paper masks, my daughter loves creating them. Again all that you need for this mask is construction paper, glue stick, craft stick and a piece of tape. I cut out the piece and my 3 year old, glued and taped the piece together, with a little help. 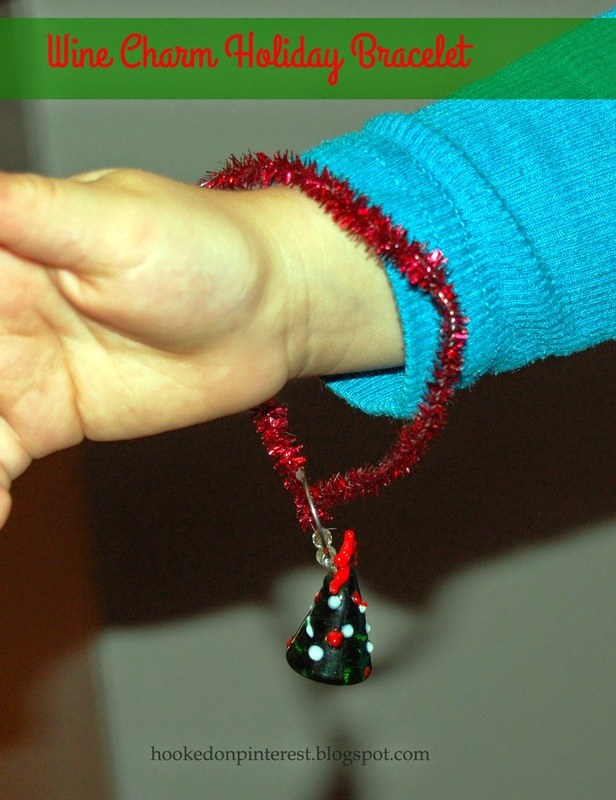 Here is another fun and easy craft for kids, especially little girls to create for the holidays. 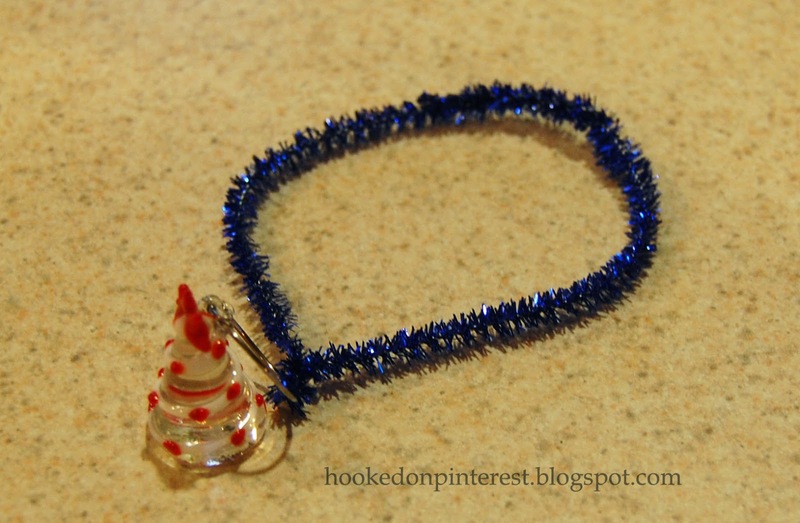 These bracelets use pipe cleaners again and take less than 2 minutes from start to finish. 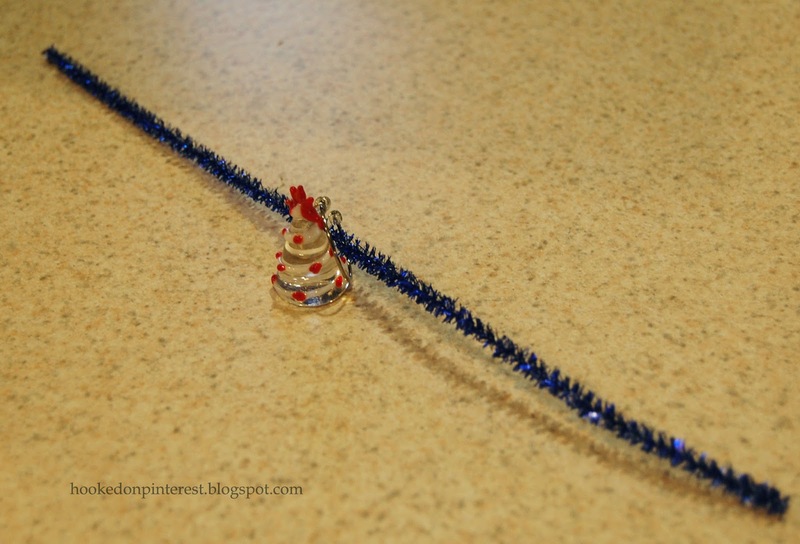 You will need to get some fun wine charms to create these bracelets. 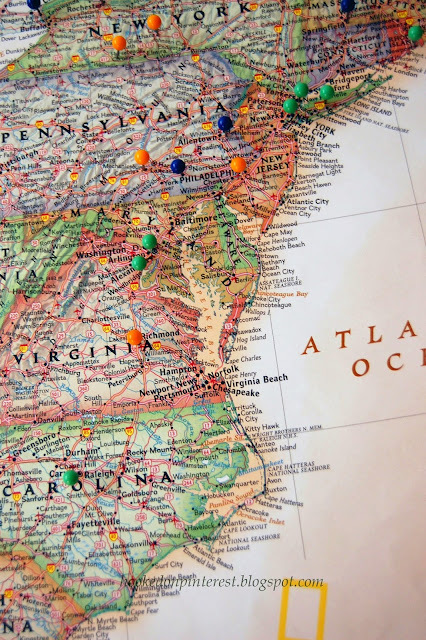 You can get these many places for not much money, I would even try a dollar store. Step 1. Find the middle of the pipe cleaner. Step 2. Twist the pipe cleaner, at middle point, tightly around wine charm hook. Step 3. Twist ends together to create complete bracelet. 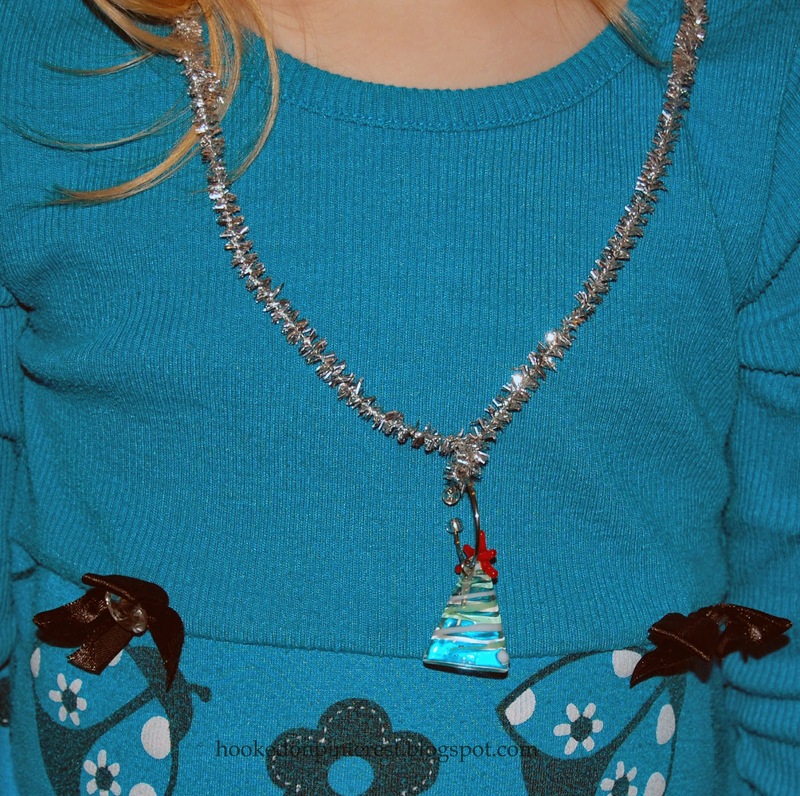 My daughter also made a necklace, that one took two pipe cleaner to make it long enough. 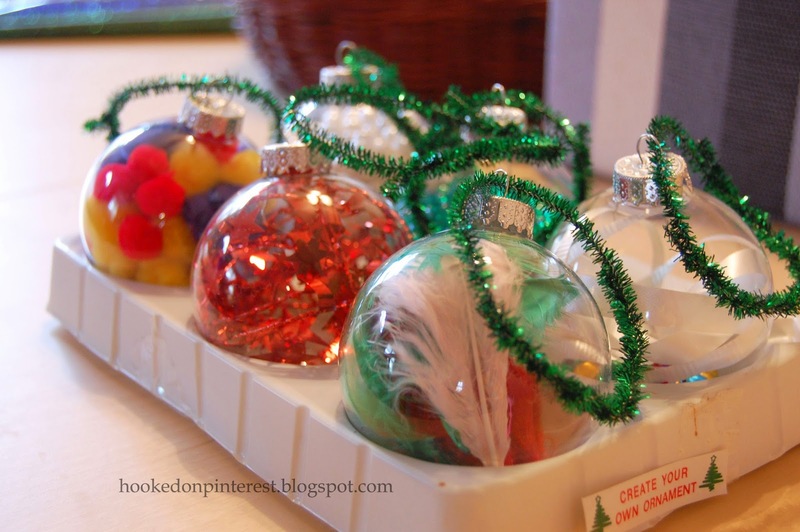 Here is another quick and easy Christmas craft you can create with your little kids. All you need are pipe-cleaners in different colors. You can use any colors that you would like to, let your imagination soar. 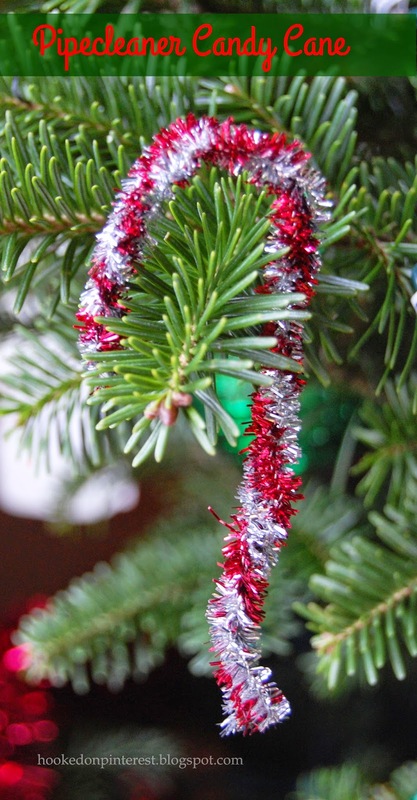 When you are finished you will have fun festive candy canes that you can use every year in wreath, on the tree, to decorate presents, etc.. Step 1. 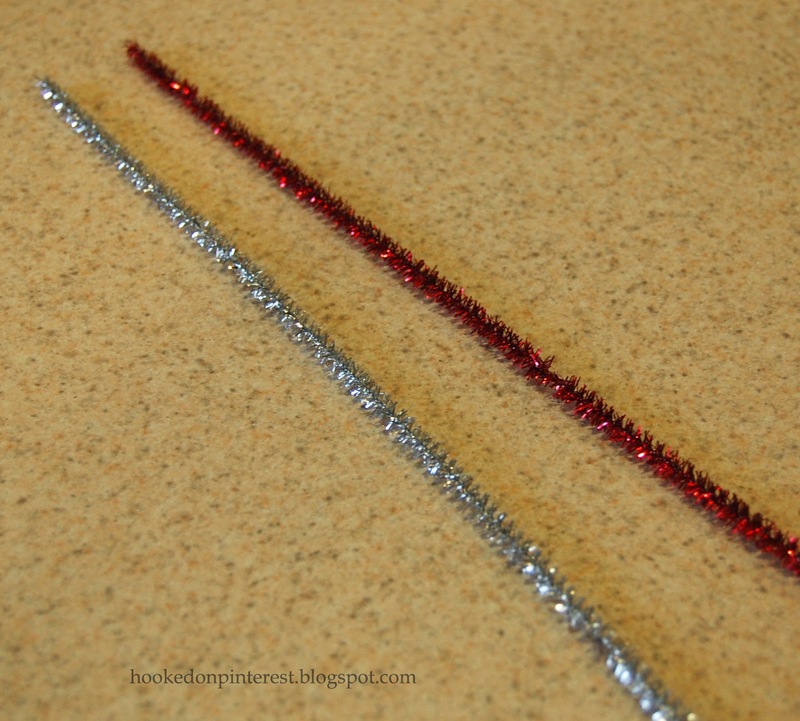 Select two different colored pipe cleaners, I chose silver and red. Step 4. 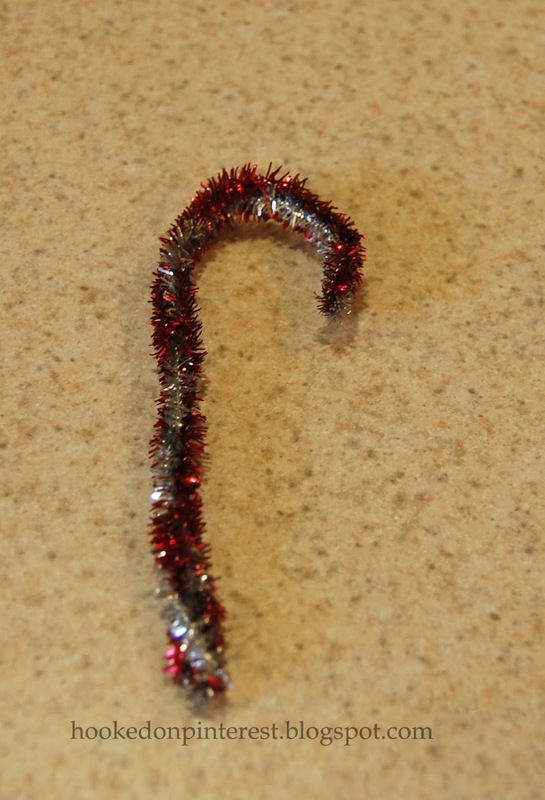 Curve into candy cane shape. Looking for a Christmas gift, check out my Etsy Shop. 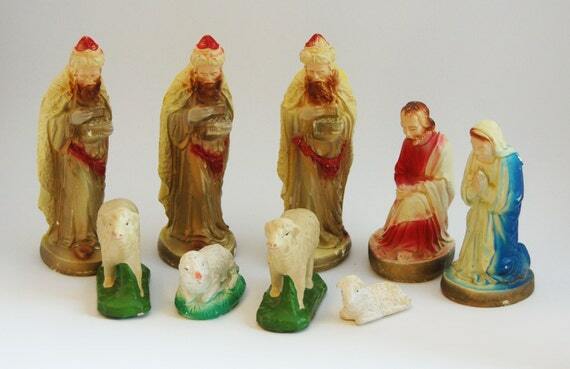 I have a couple of new items and hope to add a few more before the end of the holiday season. Last day to order items for Christmas delivery is December, 19th. 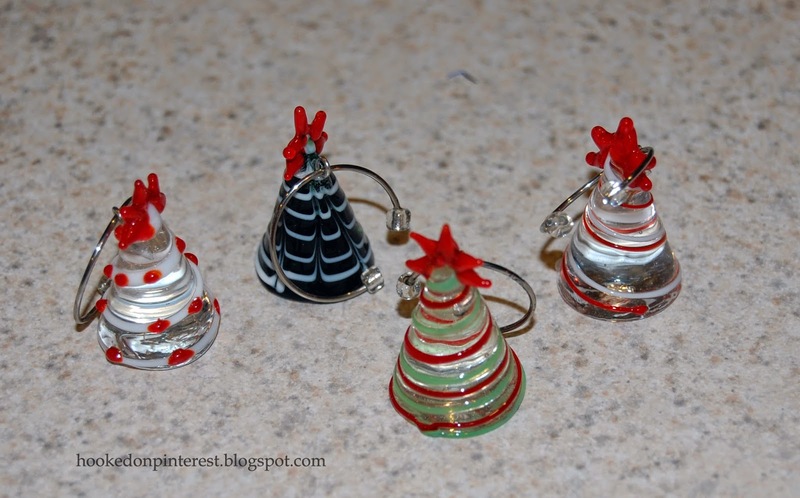 All over Pinterest I have seen people filling clear ornaments to make quick personal ornaments for their Christmas trees, so I thought I would try it myself. 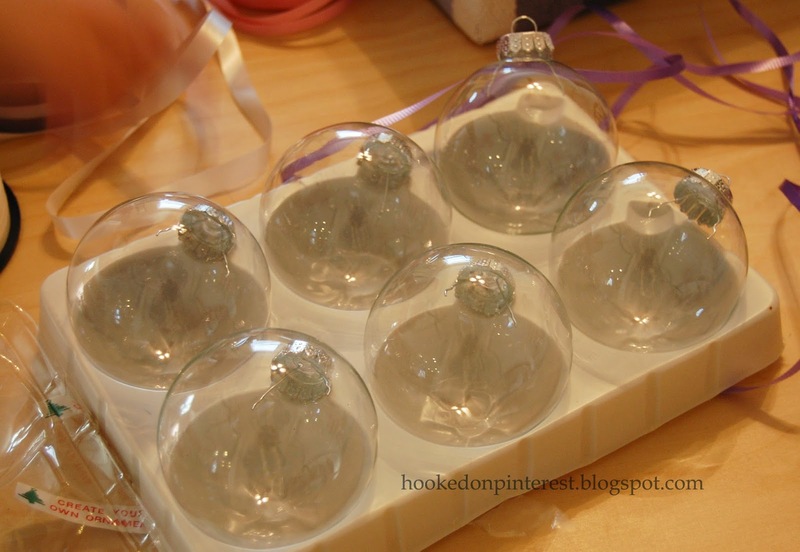 Many people out there have used glass ornamental balls, I decided to use plastic so it would be safe for my 3 year old. 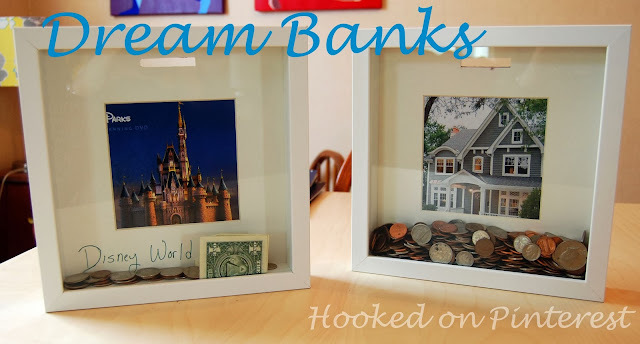 This project didn't cost me anything because I had bought a package of ornaments a few years ago for a project that I did not get to and to fill the ornaments I used craft supplies I already had. I believe I bought this package at some place like A.C. Moore a few years ago for a couple of bucks. 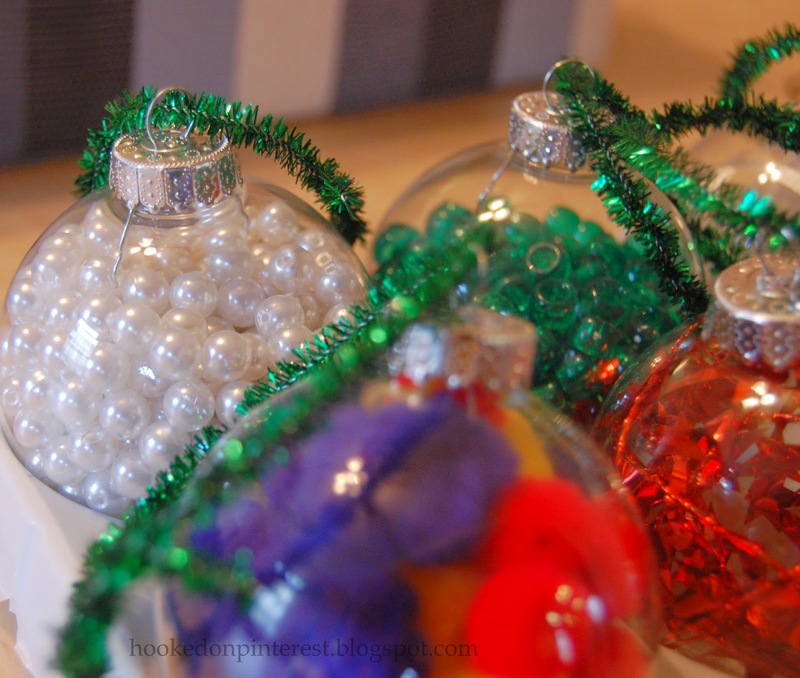 For our ornaments we used pompoms, ribbon, jingle bells, feathers, colorful beads, fake pearls and star ribbon. 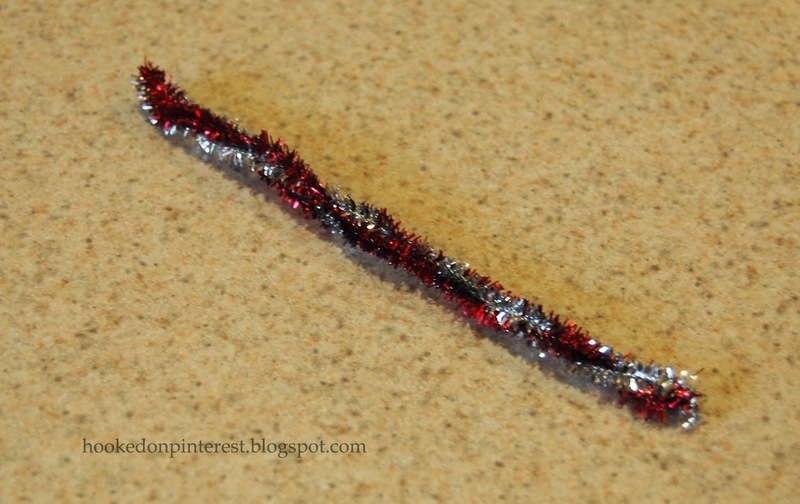 I also used sparkly pipe cleaners to create the hanging element. 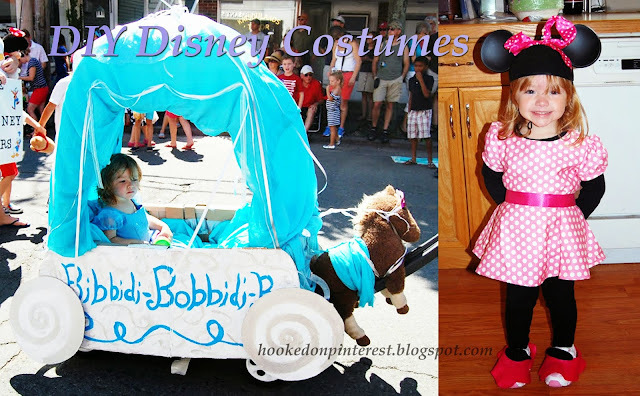 My 3 year old daughter loved creating these because she could pretty much do it by herself. 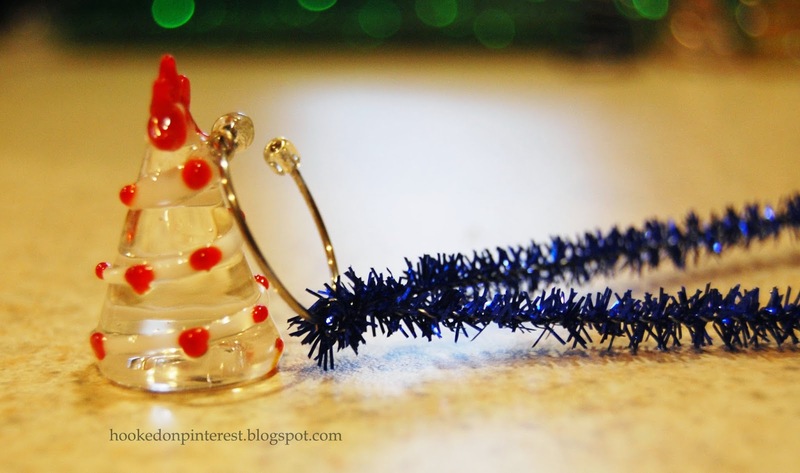 I did hold a funnel for her when she was filling the beaded ornaments, this made sure that none of the beads ended up on the floor. 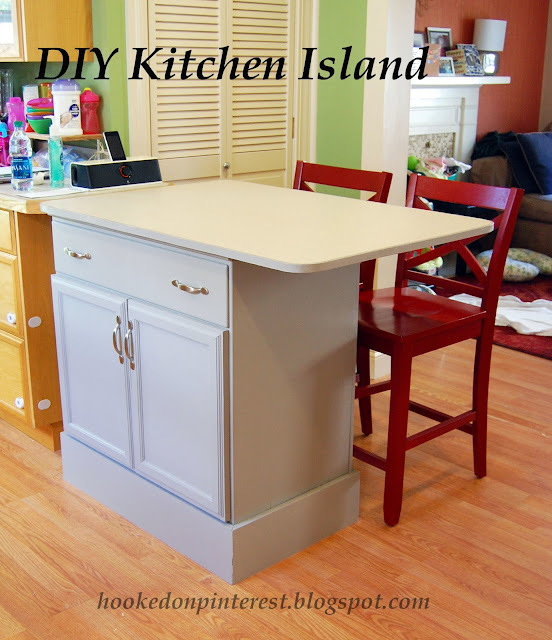 This is one of those projects that you could do every year and it would always be different. 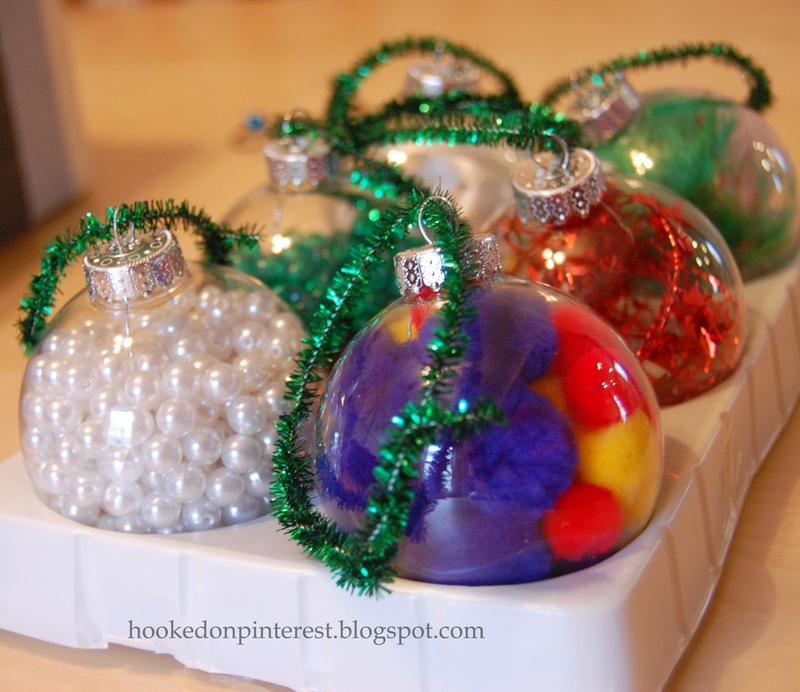 I also think this would make for a great kids craft for a Christmas Party or Holiday Cookie Exchange. This is my second year creating a gingerbread house with my oldest daughter. 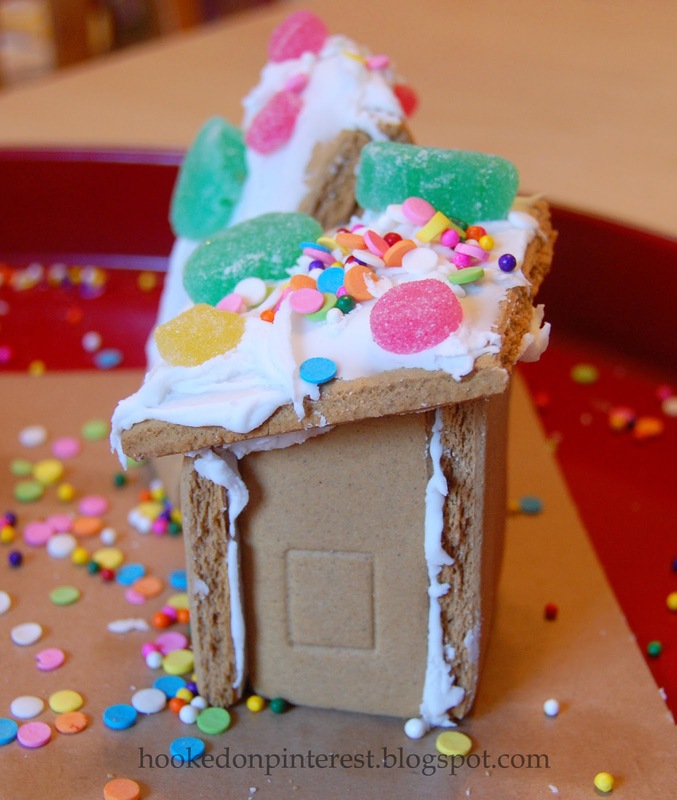 Last year we put together one single regular sized gingerbread house, I found it hard to keep the walls from falling down. 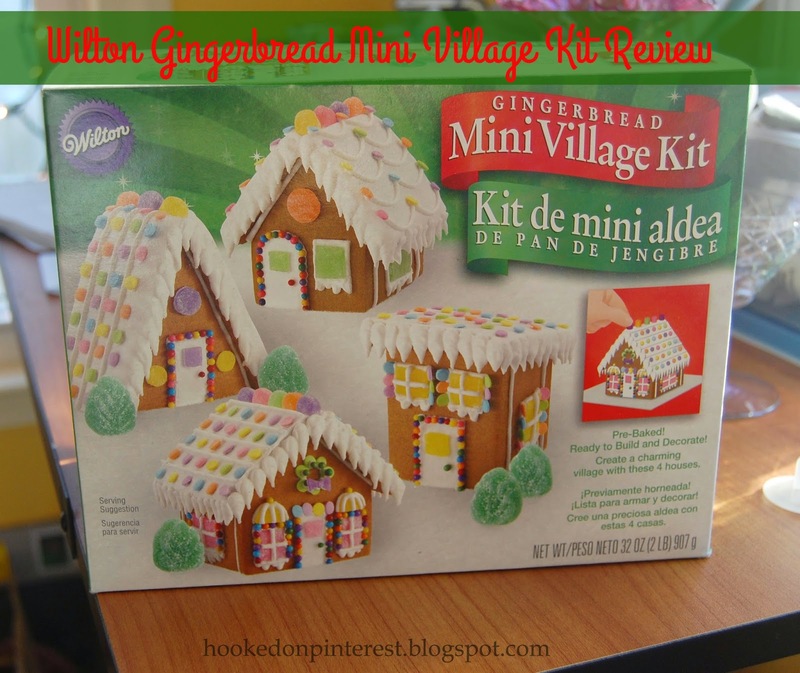 When, I saw this mini village in A.C. Moore the other day, I thought sure why not try this, it has got to be easier than the other one from last year. My 3 year old thought that it was really fun to make four houses instead of one. I started out constructing the houses as instructed, using the icing bag. After a few minutes I realized that that was not going to work, instead I used a icing knife that I had to apply the frosting. I also heated the frosting in the microwave for 15 seconds to make it easier to spread. My daughter definitely did not have the patience to wait the 3 or 4 hours to decorate the roofs. So, I just reheated the icing and applied it with the icing knife again to the roofs. One thing I found was that they do not give you enough icing to ice all the houses. If you try this you may want to by extra icing. 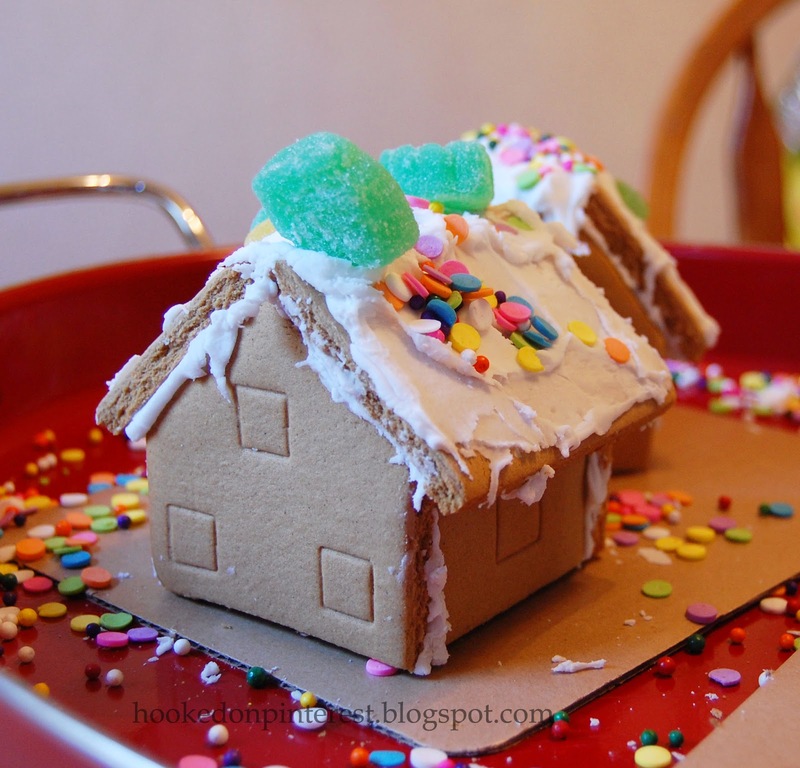 These gingerbread houses may not look perfect, but, we had fun creating. My daughter was very proud that she took part in creating them. 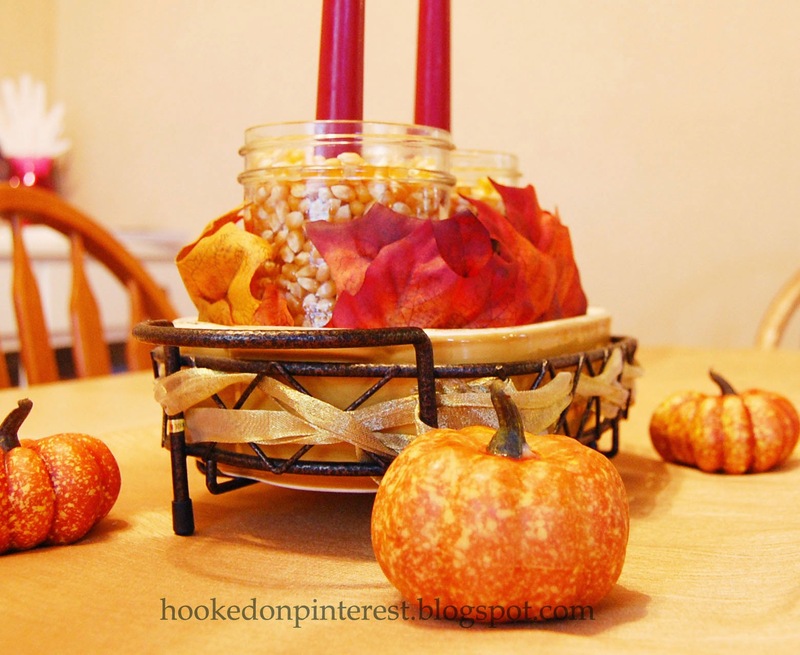 Here is a quick and easy centerpiece that would work for many tables. 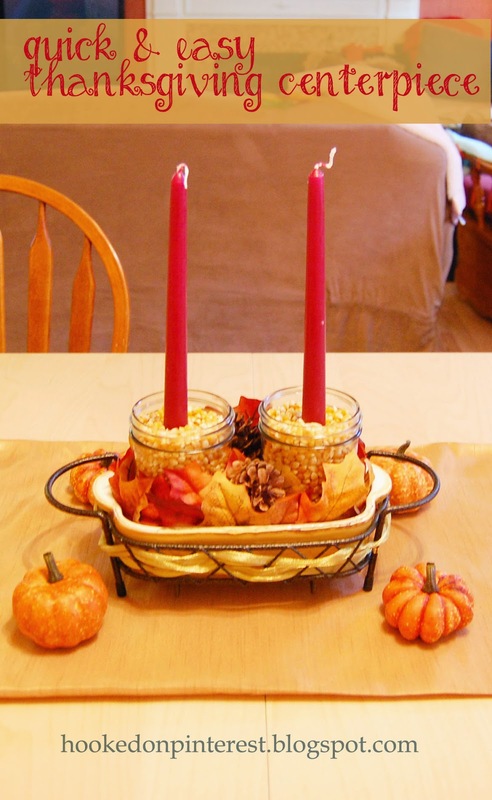 The idea behind this centerpiece is that it be easy to create and easy to move when you need room on the Thanksgiving table. 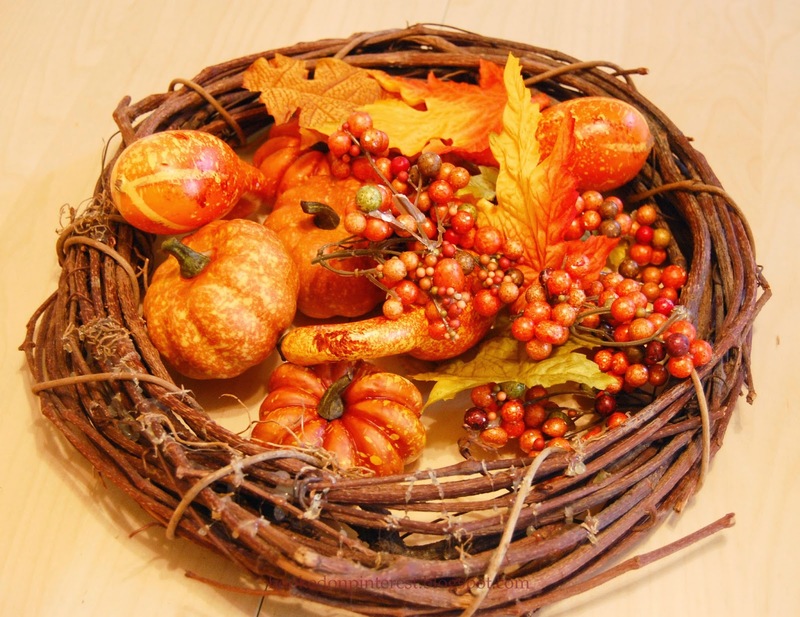 I decided to use a casserole dish that I had for the base so that it would be easy to move and I gathered most of the items in the centerpiece from around my house. 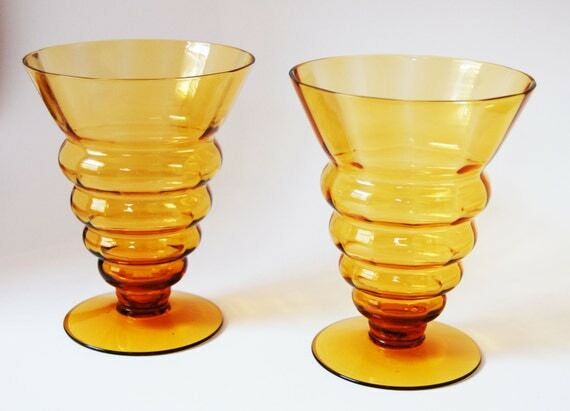 I always like to re-purpose items to give them new life before buying something new. The only things that I bought were the candles and the popcorn. 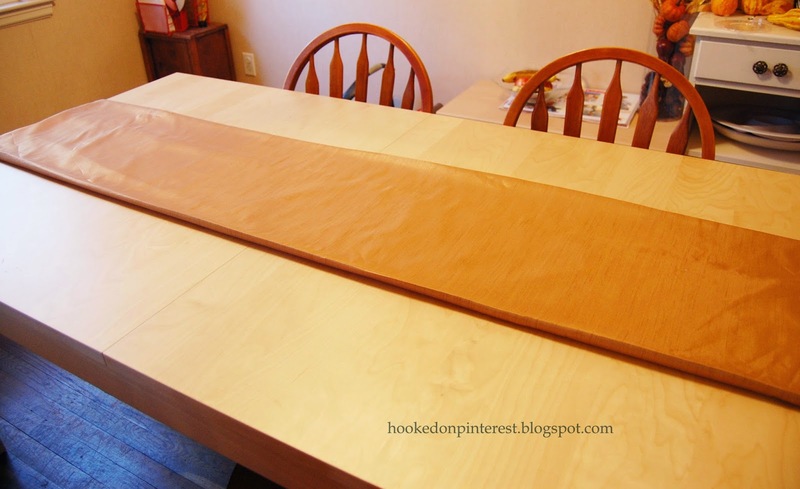 This was a relatively cheap centerpiece for me to make. 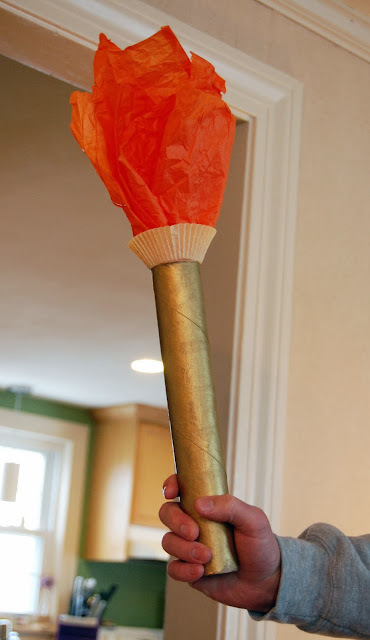 I had my 3 year old help me assemble it, she had a great time, pouring the popcorn, sticking in the candles and leaves and weaving the ribbon. 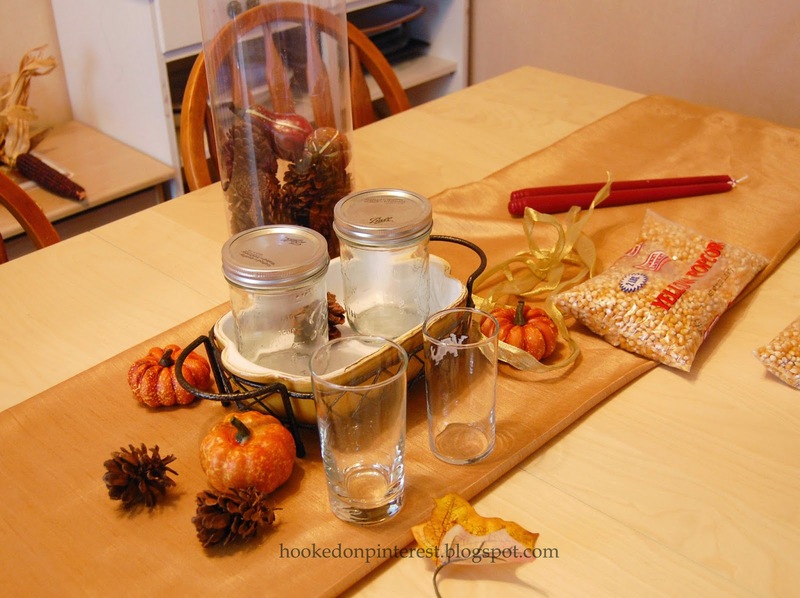 I thought it might be nice this year to have a Thanksgiving table runner. 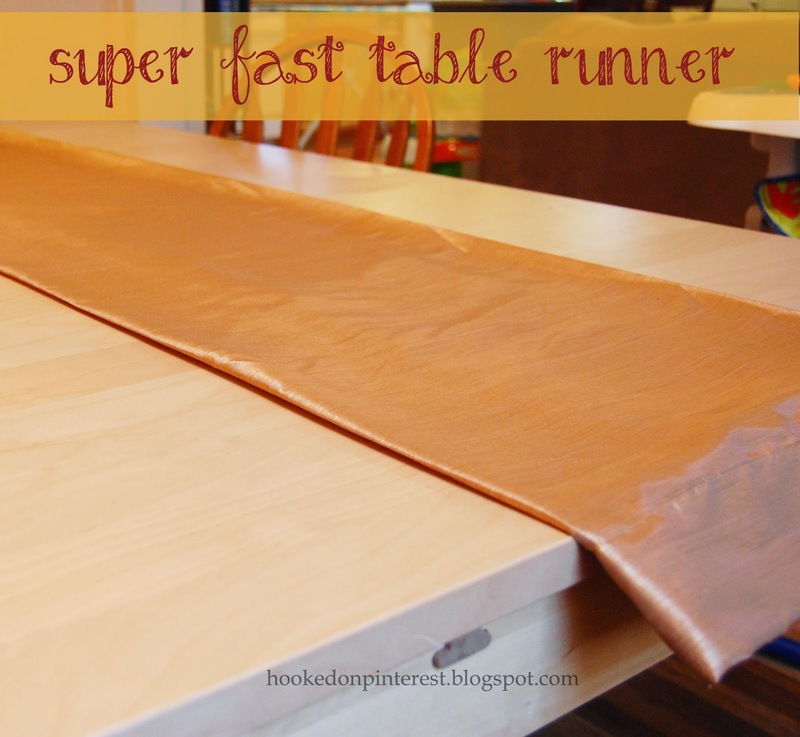 My decorations are metallic and natural colors, so I decided that a gold table runner would fit perfectly. I knew that I would not have a lot of time to complete it so here is what I did. 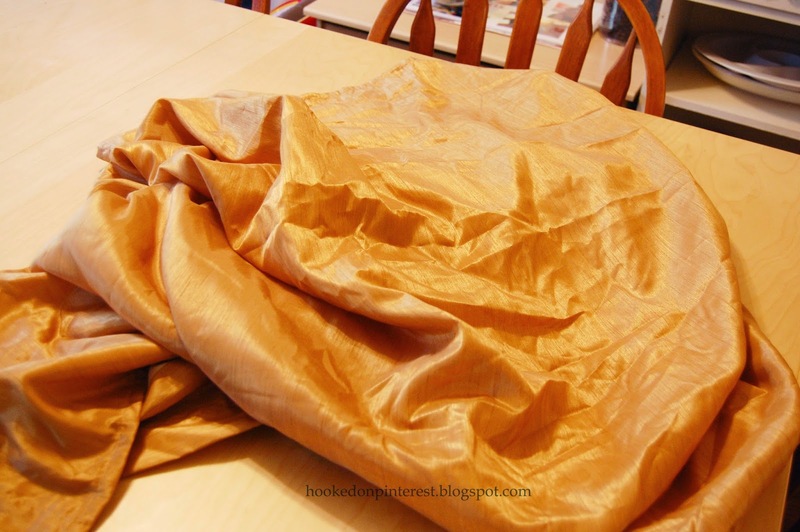 I had saved old gold curtains from an old apartment that my husband and I had years ago. All I did was fold the sides of the curtain in and iron to create a nice crisp edge. It literally took me a total of 5 minutes. 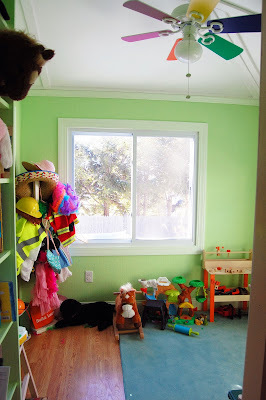 This is something that you could even do Thanksgiving morning, plus it does not ruin your curtain. Super Easy!! 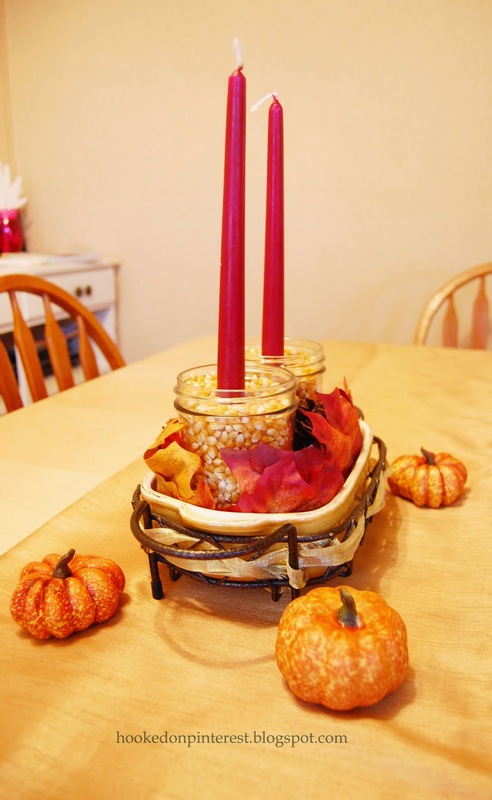 Here is a really quick and easy Thanksgiving craft. All you do is cut out the pieces from construction paper, glue on the beak/waddle and tape on the stick. Ta Da! 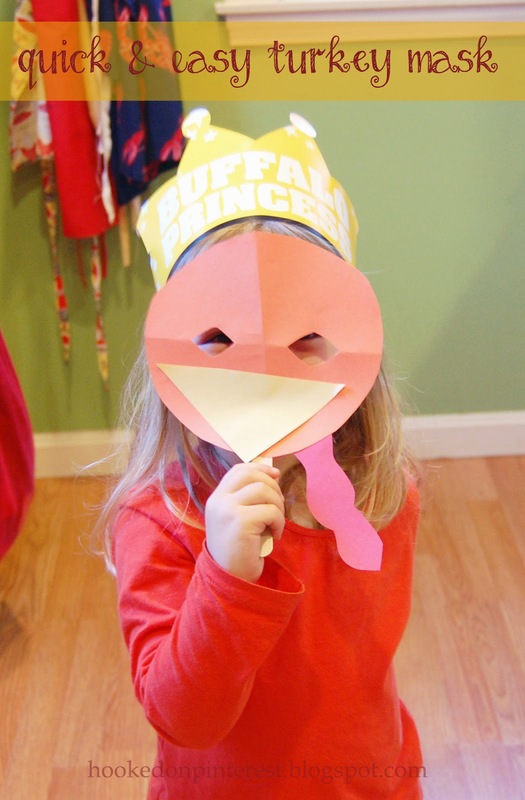 You have a turkey mask for hours of play pretend fun. 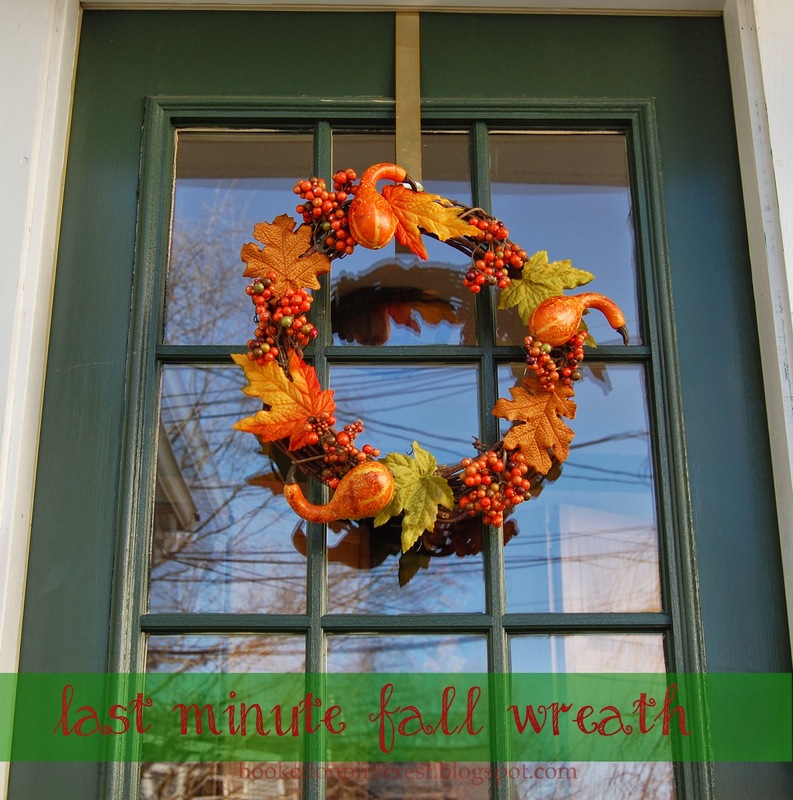 With only 2 weeks to go to Christmas decorations I still did not have a fall wreath up on my front door. Last week I stopped in CVS and picked up some fall decorations for 75% off and thought, I should probably make these into a wreath. 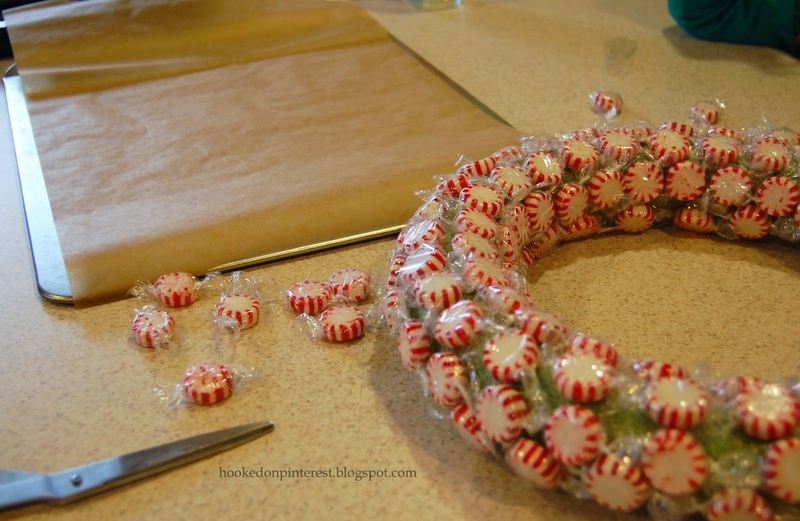 I already had the plain twig wreath and a hot glue gun, so this wreath cost me about $2.50. CVS still has some fall decor items on clearance, I think they are now 90% off, they will probably be gone by the end of the weekend. To create this wreath all I did was glue the decor items to the wreath. I know, I know it isn't even Thanksgiving yet. But, since I started my Christmas shopping last weekend and the season is short this year, only 3 1/2 weeks, I thought I would share my past Christmas posts. 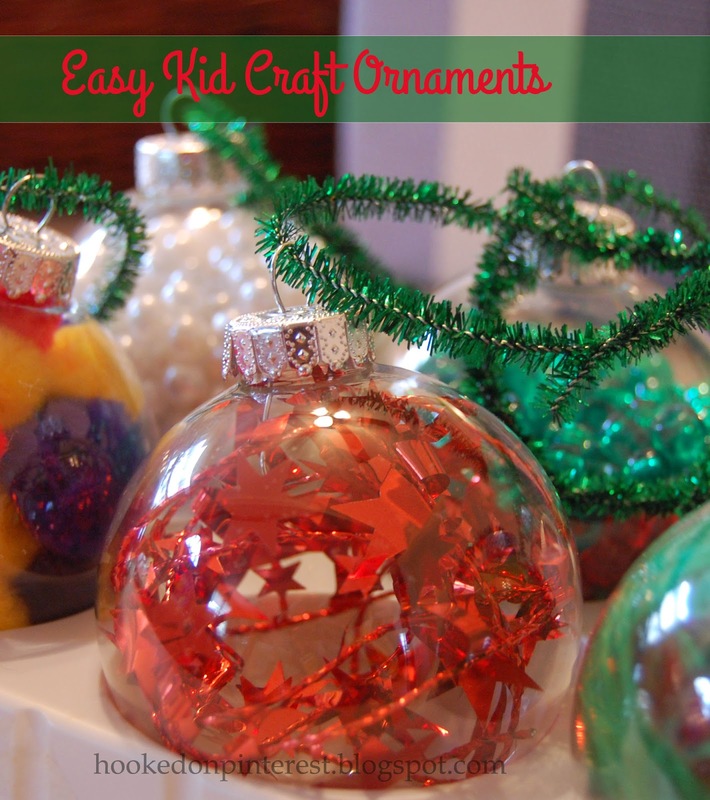 I love Christmas and will have more fun activities and crafts this year as well.